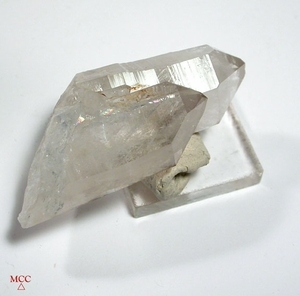 Day and night twin crystals - white and rare natural Arkansas smoky quartz - with much in common .... The taller white crystal with fluffy veils, a small back face ding, a regrowing [Hera] pocket and a slim uncommon 7h face. The palely smoky with sparse veils, no dings, a naturally healed baseline and TWO fine 'extra' faces. Overall they are 1-1/16x 1-1/16x 1-1/2" tall[miniature]. Two clear 1/2" tabular crystals display with them, one vertically and one penetratingly, giving the smoky rainbows - grounding and ascension!